Staying healthy as we age leads to a happier and more fulfilling retirement – but the older we get, the more medical decisions we have to manage. Living longer means that we’re managing more chronic conditions. When we’re sick, we often need time-sensitive tests and treatments to manage these conditions. There may come a point where you need help, so today I’ve got a checklist to help you find someone who can look out for your best interests. Navigating the healthcare system and deciding the best course of treatment isn’t easy. In our golden years, it becomes only more difficult. It’s easy to become overwhelmed, especially when our medical and mental states start to deteriorate. On Tuesday, Steve McDonald told the sad story of retired Navy captain Jim’s final medical care. What happened to Jim should serve as a wake-up call to all of us, young and old. In summary, Jim had Alzheimer’s, and he fell and broke his hip. His daughter lived across the country. Because he didn’t have anyone to speak up for him, Jim suffered through an unnecessary hip replacement and rehab. Unfortunately, Jim’s Alzheimer’s made it impossible for him to participate in physical therapy. He fell two more times and tragically passed away shortly thereafter… all because he had no one there to speak for him. That’s why Steve emphasized the importance of specifying a medical advocate. Not too surprisingly, the majority of Wealthy Retirement readers surveyed agree with Steve. 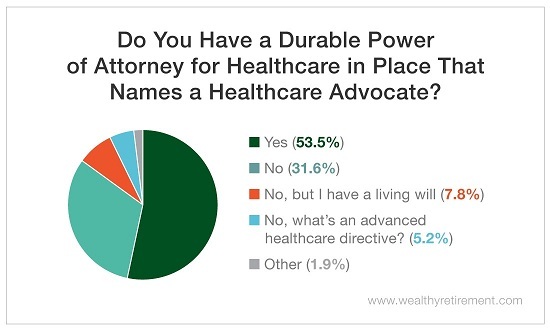 More than 53% of respondents already have a healthcare advocate in place, and nearly 8% have a living will. A healthcare advocate is a family member, a friend or even a hired professional who can help you manage your healthcare. They can ask questions, write down information and speak up for you so that you can better understand your illness. That way, they can ensure you get the care and resources you need and want, and you can focus on your recovery. A living will is a list of written and legal instructions stating your medical care preferences if you’re unable to make decisions for yourself. Specifying your wishes helps doctors and healthcare advocates make choices on your behalf if you’re seriously injured, terminally ill or suffering from dementia. In many cases, you need both. 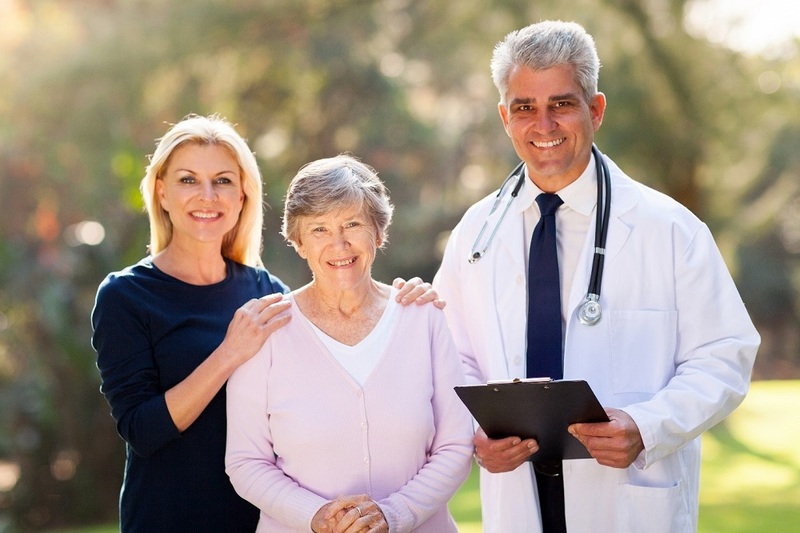 A lawyer can help you draw up a living will to specify your healthcare preferences, but you will also need a healthcare advocate to enforce those preferences, which makes selecting an advocate more difficult. Choosing someone to advocate for us about medical decisions is an important decision – and there’s more to it than just picking our spouse or child. Our loved ones could be too emotionally involved to make the decisions we want. On the flip side, family members may live too far away to effectively help us manage the medical decision-making process (just like Jim’s daughter). That’s why some people hire a professional healthcare advocate. While hiring a professional can be costly, sometimes the peace of mind is worth it. Check to see if your health insurance plan covers these services. Either way, it’s important to pick the right healthcare partner and ensure that you’re comfortable knowing they’ll make the best decisions (that you want) for your care. Calm. They pay attention to details, can ask questions, and can explain information to you and medical professionals clearly. Geographically close to you. They have the time to attend doctors’ appointments and manage any hospital or rehab stays in person. Assertive and comfortable talking with doctors and healthcare providers. They can get doctors and healthcare providers to answer questions in plain English. They can help handle paperwork associated with your medical care. Most of us don’t want to think about managing our end-of-life decisions, but we should. The medical system is complicated, and there’s a good chance that we’ll eventually need help. That’s why lining up a healthcare advocate before you need one is an important part of every retirement plan. P.S. This article was prompted by a question from one of our readers. We love to hear your feedback because we are passionate about helping you navigate the most difficult aspects of retirement. So whether it’s about financial literacy, estate planning or healthcare management, if you have a question you’d like us to address in an upcoming piece, let us know!